A few posts back, I promised to present a fictional speech, one delivered by a superhero. For this speech, I pretended that Clark Kent came to me with a very special request. Here's how I would have written Mr. Kent's speech. Good afternoon, and thank you all for coming today. Before I begin, I'd like to thank Perry White, Managing Editor of the Daily Planet, and Galaxy Broadcasting, owner of the Planet building, for hosting this news conference. I have a brief statement to read, and I'll take questions afterward. For ten years, I have served as a reporter for the Daily Planet. I am very grateful for that privilege. I have done my best to serve the public with honesty and diligence; to uncover corruption, to reveal heroism, and to shine the light of truth in the dark corners of this city. In fact, it's truth that I want to discuss today. And I'll begin by admitting that I have bent the truth over the years - bent it, I hope, for a higher purpose. That will be up to you to judge. Truth is a reporter's most cherished value, and I hope you'll believe me when I say that I did not bend the truth lightly. As you know, the Bartlett administration has scheduled a news conference with the President, to occur later this afternoon. At that time, President Bartlett will announce that I, Clark Kent, am in fact also Superman. I understand your scepticism, especially in light of past events that seem to have proved that Superman and I cannot be the same person. Today, I am telling you that those events were orchestrated by me or my circle of associates to hide the truth. If you saw Clark Kent and Superman in the same place, one of them was a robot, a shapeshifter, or one of my friends, typically the Batman, in disguise. Please watch me closely for a moment. As you can see, for years I've been using a few simple tricks to hide my double identity. Different clothes, hairstyle, voice, posture and demeanour - it's nothing more than any actor would do during the course of a role. So, why? And which role is the real person - Clark, or Superman? I was raised as a human being by my parents, Jonathan and Martha Kent, who you'll see are with us today. Hi, Ma. Hi, Pa. They raised me with human values: the importance of truth, compassion, of fighting for what's right, of helping others. I think of myself as a human being, and an American. My biology may differ from yours, but I consider myself a part of this society, this culture. I am Clark Kent, Kansas farmboy, Metropolitan newspaper reporter. Why, then, the disguise? Why didn't I simply become a policeman and use my abilities in the open, as myself? Ma, Pa and I had to invent Superman when we realized that although I may be invulnerable, the people I love are not. We realized that any criminal I brought to justice, any politician or corporate giant I troubled, could retaliate through my friends and family. I couldn't let that happen. So we invented the costume, a distracting blend of primary colours, designed to attract attention. I've always felt a little silly in it, but it helped establish a profound difference between my natural look and the public figure we invented. There's a more selfish reason, too. Once I realized that I was different from all the other people around me, I started to worry that others might not judge me for who I am, but for the things I can do. I wondered if I could ever land a job on my own merits, or publish a novel, or find a girlfriend. I wanted to be loved and respected for my character, not my abilities. I suppose a lot of wealthy folks and celebrities have experienced the same feelings. With my secret revealed, many people will feel angry, and with good reason. Any deception hurts. I regret hiding the truth from my good friends Jimmy Olsen, Perry White, and my other friends and colleagues at the Daily Planet and WGBS television. I especially regret deceiving Lois Lane, who always suspected the truth. Perhaps most of all, I regret hiding the truth from every citizen I've interviewed. You opened up your hearts and minds to me for the sake of truth, because you hoped that telling your stories would help make the world a better place. You did. I like to think that together, by revealing truth, we've done as much good as Superman ever has. And yes, I have used my abilities while performing my duties as a reporter. I have used my x-ray vision, super-hearing, infrared vision, super-speed and other powers to uncover facts that would have been closed to other reporters. Some of you will claim that gives me an unfair advantage as a reporter, and I cannot disagree. But I hope you'll understand that I never used my powers for personal gain or to invade the privacy rights of citizens - except in cases where lives were immediately threatened. In those cases, I knowingly committed a small evil in the hopes of preventing a greater one. I hope no one will blame the President for choosing to reveal the truth to the world. Once his administration uncovered it, they felt that they had no choice but to reveal it. I am confident that they chose to take this step not for political reasons, but because they felt the people had a right to know. What the administration's attitude says about privacy rights, I leave to others wiser than I to discuss. I was born as Clark Kent, and that is how I intend to lead my life. I won't wear glasses or stoop any longer; nor will I wear Superman's primary colours. I'll still watch over the world as best I can, but don't look for the bright red cape anymore; it'll just be an ordinary man with a few extraordinary gifts, doing his best to help the community, like any other citizen. 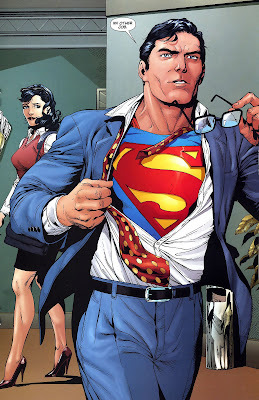 If Perry and Lois and Jimmy and all the others will have me, I would like to remain a reporter for the Daily Planet. I understand the special challenges this would entail, and it's quite possible that those challenges will prevent me from remaining an effective journalist. I understand that it might be hard for sources to trust a reporter who can detect lies, even the innocent ones. Sharing the truth with you today has been hard for me - hard to admit that I have lied by omission and commission nearly every day, even if I considered each lie an altruistic one. So I stand before you today with sadness and relief; guilt and hope; embarrassment and confidence. It's quite possible that I never trusted you enough, my fellow citizens: trusted you to understand and embrace the truth, trusted you to judge me fairly, trusted you to look after my loved ones those times when I cannot. I would like to trust you today, and I hope that in time your trust in me will be restored. Truth, like justice, is our way - the American way, the human way. I know your judgement of the truths I have revealed today will be fair, and I will accept that judgement. I got the sense this was the Christopher Reeve Superman, although the picture would be a clue (Why is Lois standing on her tiptoes in stilettos, though?). Somehow, I would never think that the Brandon Routh Superman would ever call himself human, although he would probably consider himself a citizen. (And not to say that Brandon Routh is inhuman -- well, probably his exercise regime, just that his Superman seems more distant and alien than those of other movies). Regardless, an interesting take on a hypothetical situation that any Superman would probably spend a lot of time thinking about. This is a very interesting speech. It made me think a great deal about Clark Kent's ethics. Obviously, his being Superman did give him abilities competing journalists lacked; but given that a journalist's obligation is to break a story, by whatever means, these super-abilities are no more an advantage than is having an inside source or being the recipient of a leaked text. Yet at the same time, is it ethical to use such abilities, even if only for good? Whose definition of good is paramount? Where do our freedoms end and our responsibilities begin? Etc., etc., etc. I enjoyed this speech -- hope you do another one soon!